▪ Domain Name: Build usernames from the first few characters of the domain name (only the part before the first dot is used). ▪ First Name: Build usernames from the first few characters of the first name of the customer. ▪ Last Name: Build usernames from the first few characters of the last name of the customer. 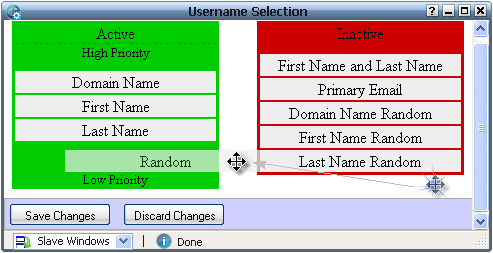 ▪ First Name and Last Name: Build usernames from a combination of the first name and last name of the customer. For example, first name followed by a few characters of the last name, first name underscore last name, first character of the first name followed by the last name, etc. ▪ Primary Email: Build usernames from the primary email address. For example, the first few characters of the part before the @, the part before the @ combined with a few characters of the part after the @, etc. 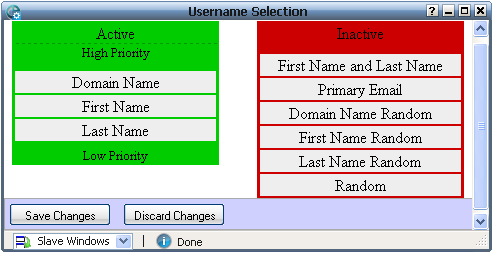 ▪ Domain Name Random: Build usernames from the first few characters of the domain name followed by 2 random digits. ▪ First Name Random: Build usernames from the first few characters of the first name of the customer followed by 2 random digits. ▪ Last Name Random: Build usernames from the first few characters of the last name of the customer followed by 2 random digits. ▪ Random: Build usernames consisting of random alphabets and numbers but starting with an alphabet.